The Joliet Junior College Foundation is launching a new fundraiser to benefit the Alumni Association Fund. 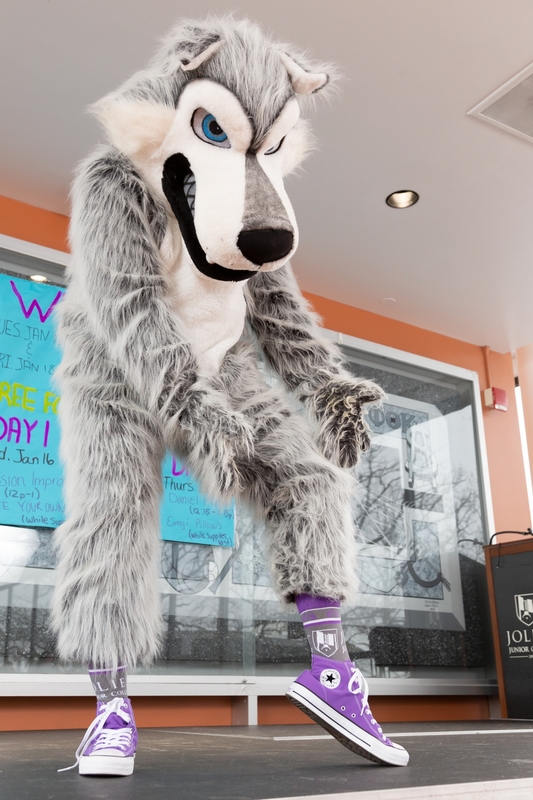 Wiley Wolf wearing the JJC socks! The Purple Sock Campaign will encourage students, employees, alumni and friends to purchase a pair of purple JJC socks and post a photo of themselves wearing the socks to social media. Carrie Anderson, alumni relations and annual fund manager, is excited for the campaign to raise money for scholarships. “The Purple Sock Campaign will benefit the JJC Alumni Association, ultimately supporting the Future JJC Alumni Scholarship,” said Anderson. Socks will be available for purchase between Feb. 4 and Feb. 28. Those that live in the area can stop by the Institutional Advancement Office in A-3023 at Main Campus to purchase their socks for $15. If you don’t live in the area, you can purchase your socks online and have them shipped to you for $20. Join the JJC community on March 1 to show off your purple socks on social media. Simply take a photo and use the hashtag #jjcsocks. “It’s a great way to get alumni, employees, students and friends of the college involved in a unique and different way. I can’t wait to see #jjcsocks posted all over social media and around campus on March 1,” said Anderson. For more information, contact Carrie Anderson at caanders@jjc.edu or 815-280-2218. Quantities are limited so be sure to purchase your purple socks early! For media inquiries, contact JJC Communications and Media Coordinator Scott Harvey at 815-280-2844 or sharvey@jjc.edu.